An F7U Cutlass on the ramp at the Naval Air Station in Jacksonville, Florida. 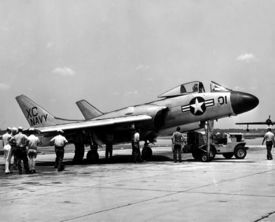 The Vought F7U Cutlass (Vought V-346A Cutlass) was a United States Navy carrier-based jet fighter and fighter-bomber of the early Cold War. It was a highly unusual, semi-tailless design, based on aerodynamic data captured from the German Arado company at the end of World War II. The Cutlass had broad, swept wings, with twin tail fins mounted on them. Pitch and roll control was provided by elevons. The very long nosewheel strut was rather weak, and a collapse could seriously jeopardize the pilot. 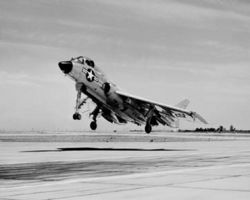 The F7U was also largely betrayed by its anemic Westinghouse turbojet, an engine which some pilots wryly observed put out less heat than the same company's toasters. Its carrier handling was notoriously poor. The J35 was actually known to flameout in the rain, a very serious fault. Three prototypes were ordered in 1946, with the first example flying on September 29 1948, piloted by a Robert Baker. Production orders were placed for the F7U-1 in a specification very close to the prototypes, and F7U-2 and F7U-3 versions with more powerful engines. Because of development problems with the powerplant, however, the F7U-2 would never be built, while the F7U-3 would incorporate many refinements suggested by tests of the -1. The first 16 F7U-3 had non-afterburning Allison J35-29 engines. The -3 with its Westinghouse J46-WE-8B turbojets would eventually become the definitive production version, with 288 aircraft equipping 13 US Navy and Marine squadrons. Further development stopped once the F8U Crusader flew. The Blue Angels Navy aerobatics team flew several F7U Cutlass as a side act during their 1952 show season in an effort to promote the new aircraft, but did not use them as part of their regular formation act. Both the pilots and ground crews found the aircraft generally unsatisfactory. Six F7U Cutlass are known to survive. F7U-3 s/n 129642 is on display at the Wings of Freedon Aviation Museum at the Naval Air Station-Joint Reserve Base Willow Grove, Pennsylvania. The aircraft belonged to attack squadron VA-12 and was flown to Willow Grove in May 1957 to take part in an air show. Upon arrival the aircraft was stricken from active duty. It was given to the Navy Reserve as a ground training aircraft, and eventually placed as a gate guard in front of the base on US Route 611. The airframe has only 326.3 hours TT. F7U-3M s/n 129655 is on display at the National Museum of Naval Aviation in Pensacola, Florida. F7U-3 s/n 128451 is located unrestored and incomplete at the Fred E. Weisbroad Aviation Museum/International B-24 Museum in Pueblo, Colorado. Its condition is poor. F7U-3 s/n 129554 was purchased by Len Berryman from Geiger Field, Washington in May 1958 and displayed outside the Berryman War Memorial Park in Bridgeport, Washington from 1958 until 1992. In June 1992 it was sold to Tom Cathcart of Ephrata, Washington for restoration to eventual flying condition. This aircraft is currently undergoing restoration at the Museum of Flight in Everett, Washington. F7U-3 s/n 129685 has been located for many years on the farm of Walter Soplata in Newbury, Ohio. Like most aircraft on this famous farm the aircraft appears complete, though it's exposed to the elements and unrestored. An F7U (s/n unknown) is currently undergoing restoration for display at the USS Hornet (CV-12) Museum in Alameda, California. F7U-1 - The initial production version. (14 built). F7U-2 - Proposed version, it was going to have two Westinghouse J34-WE-42 engines, but it was cancelled. ↑ Body Reading. Retrieved on 2006-01-17. ↑ Taylor, Michael J.H., ed. “Chance Vought F7U Cutlass.” Jane’s Encyclopedia of Aviation. New York: Crescent, 1993. p. 253-254. ISBN 0 517 10316 8. This page was last edited on 6 March 2007, at 07:30.